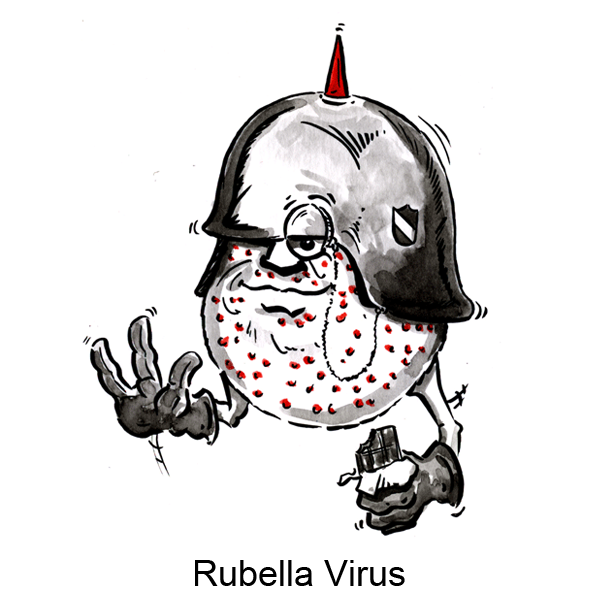 Signs & Symptoms: Rubella is commonly known as the “German” or “three day” measles. It is a mild viral infection with a red rash starting on the face and spreading to the trunk and then to the arms and legs. The rash does not appear on the palms or soles. Spread: Rubella is spread by contact with an infected person. Who is at risk: Anyone who has not been vaccinated or who has not already had rubella is at risk. The rubella virus can cross the placenta in a pregnant woman and cause birth defects in the baby. Prevention: A vaccine is available for immunization of children. The vaccination is called MMR because it protects against Measles-Mumps-Rubella.